On October 11, Macedonians celebrate a public holiday known as People's Uprising against Fascism Day or Revolution Day. 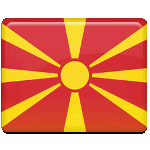 It commemorates the beginning of the National Liberation War of Macedonia against the Axis occupants. When the Second World War began, Macedonia was part of Yugoslavia. In April 1941, the Kingdom of Yugoslavia was conquered by Axis forces and partitioned between Italy, Germany, Bulgaria, and Hungary. Following the occupation, the Yugoslav partisan movement was formed. The anti-Axis resistance in Macedonia began on October 11, 1941, when the first Macedonian partisan military units emerged. Macedonian partisans rebelled against the occupants, sparking a full-fledged liberation war. These partisan units eventually grew into the People's Liberation Army of Macedonia. Macedonian resistance lasted until November 1944, when Vardar Macedonia was completely liberated. After the war, Macedonia became part of the Socialist Federal Republic of Yugoslavia. Day of the Uprising against Fascism is one of Macedonia's most important holidays. It is celebrated throughout the country with formal ceremonies. As it is a public holiday, all citizens have a paid day off.